Four full-size grandMA consoles accompanied Prince on his recent Welcome 2 Australia Tour. Prince played 14 shows in Melbourne, Sydney and Brisbane, Australia. A.C.T Lighting supplied all the lighting and video control for the tour, which were driven by three live grandMA1s; a back up grandMA was also on hand. Tour director and production designer Demfis Fyssicopulos said he specified the systems for their versatility and reliability. 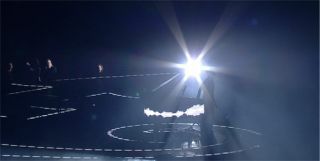 The lighting complement for Prince consisted of a fully-automated rig arranged on a lighting truss structure with a center hexagon an six radiating spokes. At the end of each spoke were six lighting pods with a videowall flown in front to conceal them. The entire stage was outlined by Nocturne V9 LED tiles, which were driven by a Control Freak system with audio-responsive VU meters triggered by grandMA. Prince’s piano and drum set were wrapped with magnetic video wallpaper. Four overhead projector clusters projection mapped the stage with custom content and the output of an interactive video system. The latter system, conceived by Fyssicopulos during the 21 Nights In LA residency, features two thermal-imaging cameras that track the body heat of anybody on the stage and generate real-time interactive video content that is then projected onto the stage. For example, glitter trails were projected that followed the artist’s steps. On Welcome 2 Australia PRG provided the lighting system and rigging. Nocturne/Big Picture the video elements, Tait Towers the stage, Show FX the confetti and Co2 cannons, and Control Freak Systems the interface to control the video elements from grandMA and the audio-responsive video elements.